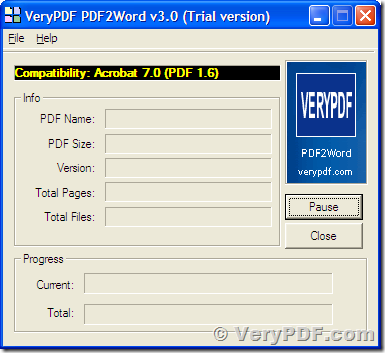 VeryPDF provides some conversion tools including PDF to Word OCR Converter and PDF to Word Converter. The main difference between the two applications is OCR (Optical Character Recognition), and is described in detail in the last article. This article will be going to tell about the difference between the two applications. Before reading this article, you can visit the homepage of VeryPDFto know the two different applications. The following paragraphs will be mainly about the different usages of PDF to Word OCR Converter and PDF to Word Converter except the OCR function. Firstly, let us see the different interfaces. Figure 1 shows the main interface of PDF to Word Converter, and Figure 2 shows the one of PDF to Word OCR Converter. You see the two interfaces are quitely different. PDF to Word Converter does not provide its options directly on the main interface, and it does not have a process queue - a file list to list waiting PDF files. 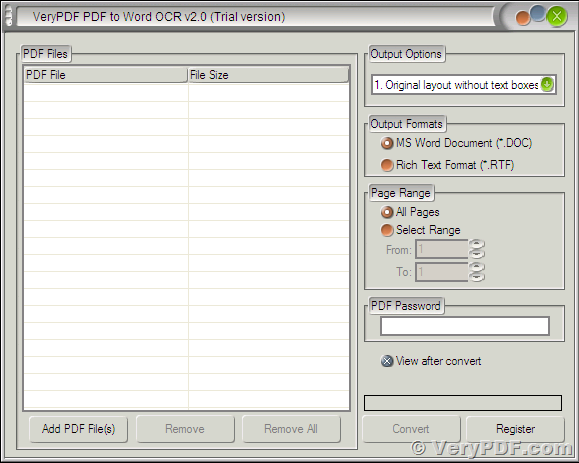 The main interface of PDF to Word OCR Converter has shown all the options in its right part. The different user interface will lead us to usages of the two applications. Secondly, focus on the different usages. To process the PDF and convert them from PDF to Word, you have to open them by the applications. Now let’s see how to let the applications know which PDF files to process. 1) Select File -> Openon the menu bar of the interface as displayed in Figure 3. Then you will see a familiar file picker window as the same as you see when using other applications to open files on Windows. In the file picker window, you can select one PDF, or multiple PDF for batch process. 2) Drag one or more PDF from Windows Explorer and drop them to the main interface of PDF to Word Converter to tell the application which files to process. 1) Press button Add PDF File, and then select one or more PDF files in the coming popup file picker dialog. What is different with PDF to Word Converter, the files added to PDF to Word OCR Converter will not be immediately processed but just put into a process queue shown in the left part of the interface. 2) The other way is the same as PDF to Word Converter does, you can just drag and drop your PDF files to the interface, and put them into the process queue. Thirdly, see the difference in setting options. 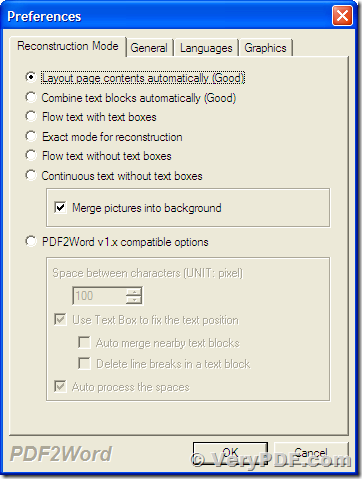 For PDF to Word Converter, the option dialog will appear immediately after adding original PDF files. In the Preferencesoption dialog, you can set the reconstruction modes and other options as shown in Figure 4. 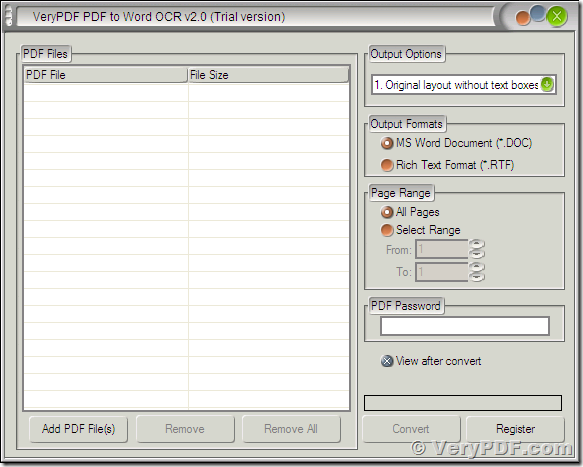 For PDF to Word OCR Converter, you can directly set the options before or after adding original PDF files. All the options are provide on the main interface, and you need not to set them by a dialog box. Finally, the primary difference is that PDF to Word Converter does not support OCR, and PDF to Word OCR Converter does. In one word, the latter contains all the functions of the former. If you want to try the two applications, you can go to VeryPDF to download them for free. How to import PDF documents into VeryPDF PDF to Word for iOS (iPhone and iPad) App? How to edit PDF in Word? This entry was posted in PDF to Word Converter and tagged PDF to DOC, PDF to Word. Bookmark the permalink. PDF to Word OCR Converter interface seems powerful, it is good if you can capture a screenshot for PDF to Word OCR Converter and show it to me, thank you. Hi, thanks for your comments. 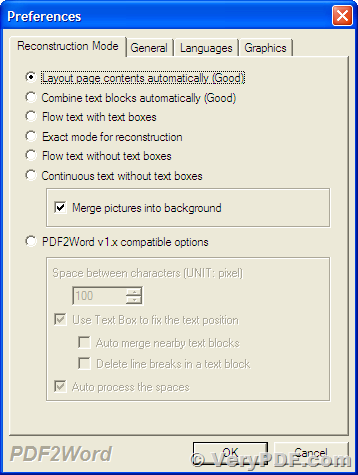 Figure 2 is the screenshot for PDF to Word OCR Converter. And here the free downloading link for you, http://www.verypdf.com/dl.php?file=verypdf2wordocr.exe. Download it to your PC, you can feel more about it. this online tool is free, I'm often use it to convert my small PDF files. But for the scanned PDF and image files, your PDF to Word OCR Converter seems better. are you advertising your online website? I'm using your PDF to Word to convert my bank invoice, but some characters can't be converted into MS Word document, what wrong with this matter? If you like, maybe you can send us your bank invoice to us then we can have a check for. You can send us a letter to support@verypdf.com. We will give you a satisfying answer as soon as possible. I have double checked my bank invoice PDF document, these strange characters are using Type 3 embedded fonts, is this the reason of why these characters failed to be converted into MS Word document? Hi, maybe it is the reason. If you just need to change some characters, you can use PDF editor(http://www.verypdf.com/pdf-editor/index.html) to modify it. Or Screen OCR (http://www.verypdf.com/screenocr/index.html) is also good in this aspect. As to detail steps, you can come to our live chat then we will show step by step. The trial version is can only convert first 5 pages from PDF file to Word document, I want convert from page 20 to page 25, this is not allowed in trial version. Bad. Hi, if you need to convert page 20 to 25 or more, you can have use the full function version. You need to pay for it on its website then the code will be sent to your email box. With the code, you can use this software forever and you can convert all the pages. As to the page range, you can set them on the software interface. If you have any further question, please contact us by the ways supported on this website(http://www.verypdf.com/support/index.htm). No, no, I don't want to purchase this software yet, can I convert from page 20 to page 25 in trial version? Please don't ask me to buy this software. If you do not want to buy it now, you can use our software PDF Split-Merge(http://www.verypdf.com/pdfpg/index.html) burst this PDF file to single page PDF files,then you can use PDF to Word to convert these single PDF files to DOC one by one. Though it is a little complicated but it is totally free. If you use the full function version, all can be saved. maybe there should be less limitations in a trial version application. (A).Does the "VeryPDF Scan to Word OCR converter" convert jpeg files, specifically, SCANNED TYPE-WRITTEN PAGES (i,e. A page that is typewritten and then scanned as a JPEG file) into HTML files? (B). Can it convert JPEG IMAGES such as Photographs into HTML files? Hi, (A). this software does support image and scanned document but it can not recognize SCANNED TYPE-WRITTEN PAGES. OCR only can recognize standard characters and fonts. You can convert image to doc then save doc as HTML files. (B). This software can not convert IMAGES to HTML directly, you can convert it to doc file then save it as HTML file by MS office. If you do not have MS office installed in your PC, you can use free OpenOffice. this OCR application seems great, but can it help me OCR Turkish PDF files? You can download a language package for Turkish, http://www.verypdf.com/pdf2txt/ocr-language.htm . Then Apply the language package following the instructions on the webpage. By using the the OCR converter, will it generate a different target file if I set parameters before adding source file? Sure. It will create a new target file. The file formats before and after conversion are different. image with blurred and unrecognizable text will directly be exported to new word. those images with recognizable text will be converted to editable text in Word. Do I need purchase Adobe Acrobat to use this product? Most VeryPDF products are independent of a third party PDF application. That means you need not buy Adobe Acrobat or use free Adobe Reader to convert your PDF to Word with PDF to Word (OCR) Converter. Sorry to ask that: can PDF to Word OCR Converter process only odd or even pages of PDF, please? ? ? and for even number, you can specify page number 2, 4, 6, 8, ... in "Select Range" before conversion. If I pause my conversion when using PDF2Word, is there any difference when I start it again? Presently, you can only stop and restart again. We strongly suggest you do not change status of the application while processing. Can this OCR recognize all the font style？What about writing style? Hello. As mentioned in the article, handwritten text can hardly be recognized by a machine. So, the accuracy rate will be very low when OCR handwritten text. Do you have a PDF to Word Converter for Mac system?